Won’t you be my neighbor?! 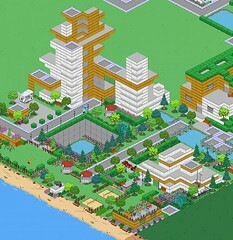 One of the most intersting features about The Simpsons Tapped Out is the social aspect. Most mobile games I have played didn’t have that aspect and it adds so much to your gameplay, especially during special events! I personnaly really enjoy going to other people’s Springfield to see what they have done with it. The way some of us display our buildings and decorations is what catches my attention most. Sure, we all visit to make a few dollars and xp but when you stop and think about how there will never a town that looks like the next one, it’s pretty amazing. Some people have very clever ideas as to what they put next to what. In my town for example, there is an area where I put all the restaurants and added tables in the middle and decorations around ( http://www.flickr.com/photos/[email protected]/11264367665/ ) I visited people who are so creative with what EA gave us. I have even seen 2D and 3D designs made with fences, schrubs, you name it! I have loaded up my neighboreeno list up to 100 just before the Halloween event started and for all of October, visited almost everyone everyday. It paid off with a lot of spooktacular donuts and I got a chance to see many beautifuls towns at all sorts of levels. What I would like to do at this point is clear up my list completely except for a few friends I know in real life and start over fresh with readers from this blog. While obviously I want to see more towns I never saw before, I also want to give a chance to people who read my posts and come to this page regularly to be able to get a good view at mine and interact with me during the Christmas event. My Origin id is the same as here: PlatypusGuitar. If you would like me to add you, please leave your Origin id in the comment section below. 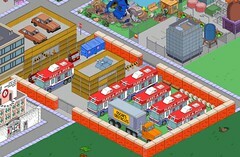 I would also like to know, what do YOU like about visiting other players’ Springfields? I look forward to read your opinions and visiting you neighboreenos! Since we are approaching a special event, you can also find more neighbors HERE. One of things I enjoy seeing are snapshots from other players, showcasing not their town design, but interesting moment that take place in their town. Most of the time it involved different characters, seemingly interacting while on a task. You don’t always plan these moments, so when the opportunity to take a snapshot arises, it’s too good not to share these with the community. Here are a few things that caught my eye recently, mostly from users on Reddit and our Flickr group. What have you done with the Burns Coffin? If Count Burns really is a vampire then it makes sense for him to keep his coffin close to the manor. After all, if someone were to destroy the coffin that would also destroy him. The following players decided it was best to keep this coffin hidden, somewhere random passersby won’t be likely to find it. Do you plan to keep this coffin near the Burns Manor, or do you have other plans in mind? What have you done with the Gypsy Fortune Teller Shop? Last year the Halloween event focused on zombies, but this year we have ghosts. Who better to communicate with the spirits from the great beyond then a gypsy fortune teller? It is only after you finish the construction on her shop that you notice all of the ghosts that are haunting your town. It’s been a few days, so let’s see a few examples of this building incorporated into Springfield. Instead of just posting a bunch screenshots, I’m going to add a little commentary as well. Many of these design layouts are particularly interesting, and make it a treat to see the creativity of other players while you’re popping ghosts and haunting buildings in their town. Visiting other users towns is an important element of the game. If you would like to make some new friends, post your user name here. When you visit a friend’s town you can tap up to three buildings, earning yourself some money and XP. You can even visit your friend’s Krustyland.